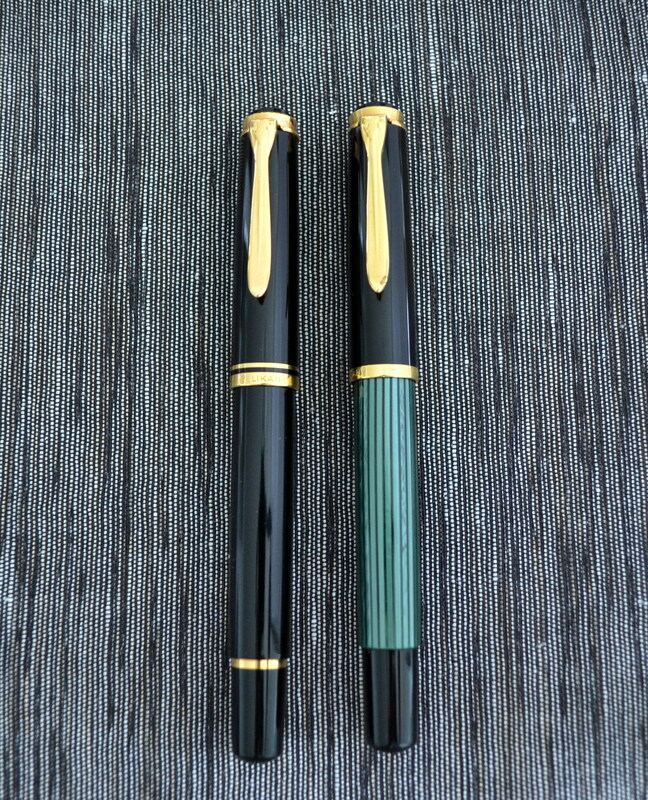 In 1988 Pelikan introduced the M600, a M400 sized pen with the upgraded trim of the larger M800. The M600 was sold with a monotone 18kt gold nib for it’s first year only, switching to a bi-tone 14kt gold nib in 1989. In my opinion, the 1988 Pelikan M600 is the most desirable model as its nib is softer than any other post 1960s fountain pen I have used. The M600 features a classic design that Pelikan has been using since the 1950s with the introduction of the 400. The M600 differs from the modern M400 in that it has an extra gold cap band, a gold band on the piston knob and a gold band on the end of the section. 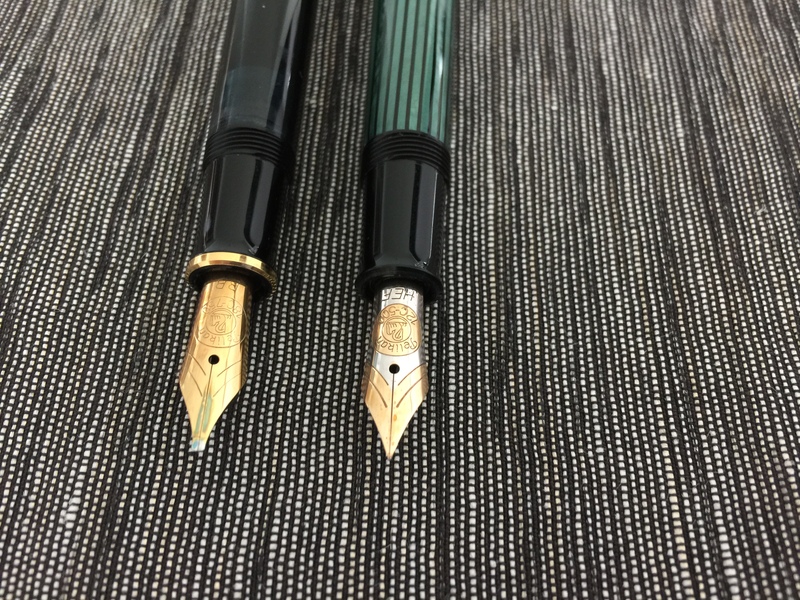 Pelikan M600 and Pelikan M400 with rare 12C HEF nib . 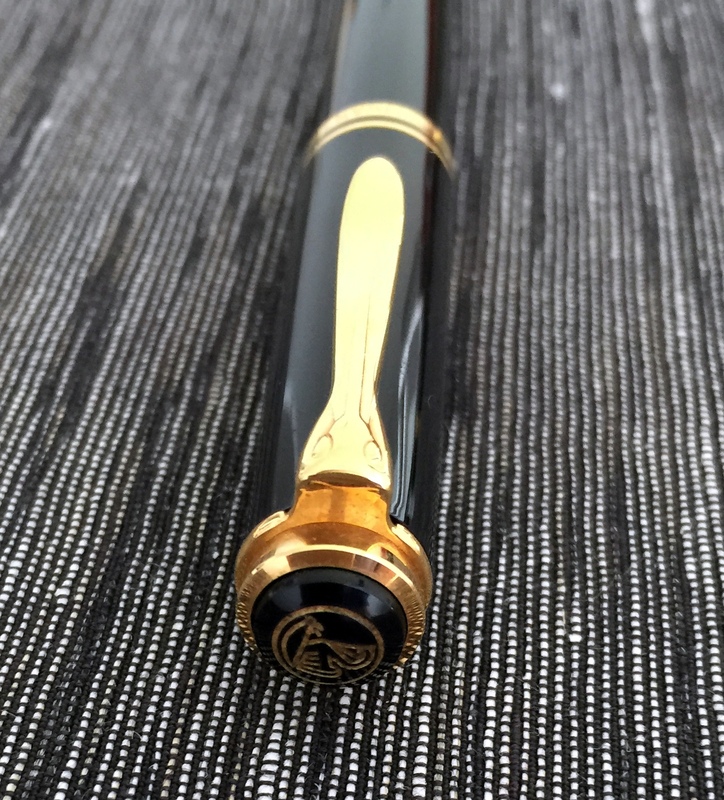 In solid black with gold trim this pen’s classic styling wont be garnering much attention but it is elegant and understated. Is this a good quality pen? I spent a lot of time thinking about this and my honest answer is no, not really. The fit and finish of the gold furniture is pretty good and the threaded nib assemblies are a great design that allows the user to easily swap nibs. The finish of the black plastic (or “resin”) barrel and cap is excellent but the plastic section has big nasty seams. As big and nasty as those seems are they were not easy to photograph. The M600 does not have the screw in piston assembly of the modern M800 and M1000 fountain pens; instead it snap fits into the barrel. This makes the pen much less serviceable and more prone to breakage. When I received my M600 I noticed the piston knob was not sitting flush with the barrel and after some research I discovered that this was a side effect of the “snap-fit” design of the piston assembly. With the palm of my hand I was able to knock the knob back into place (thank you to Francis Goossens for the tip) but there is no guarantee that it wont pop back out again with use. I know this is an old pen (as old as I am in fact) but I have not had this problem on any of the dozens of piston fillers I have owned produced from the 1940s to present day. The pre-1997 M600 is the same size as the M200, M400 and classic 400. 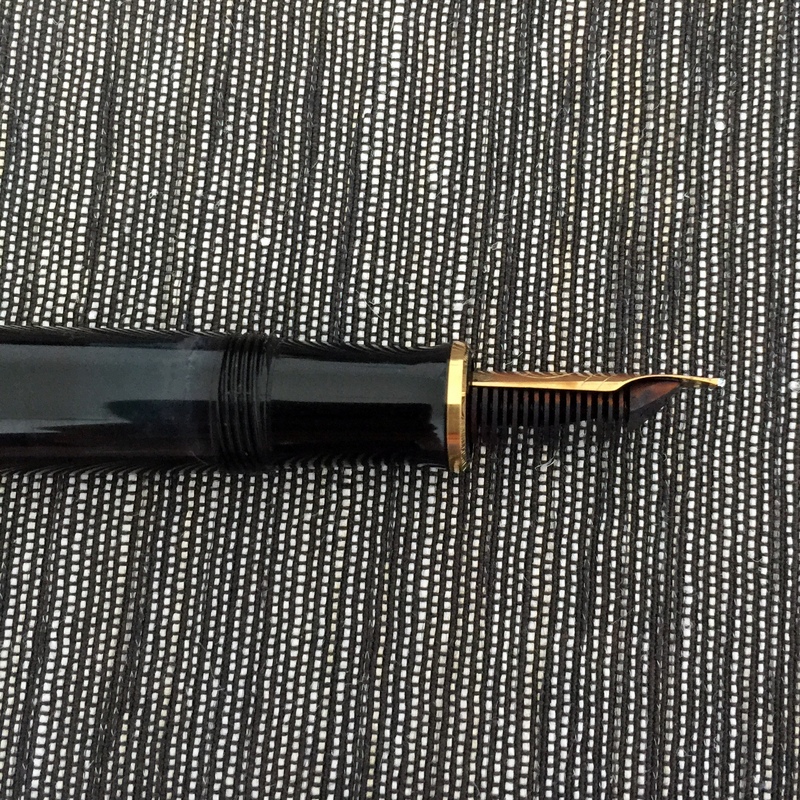 This was considered a standard size pen back in the 1950s but today it seems a bit small. The post-1997 M600 is larger and, as you would expect, sits in between the M400 and M800 sizes. I find the M600 to be very comfortable. It measures 12.5 cm capped, and 12.2cm uncapped. It weighs a mere 15 grams with half a tank of ink. People with larger hands will probably want to post this pen but for me it is comfortable posted and unposted. As mentioned above, in it’s first year of production the M600 was fitted with a single tone 18kt gold nib that was also used on the M700 Toledo at the time. This is one of the softest post 1960s nibs I have ever used. The BB point is stubbish and offers line variation without pressure. The nib is ultra smooth and quite wet. By comparison, my Pilot music nib puts down a thinner line. The nib sings a bit, which some people may find annoying but it has no affect on the performance of the nib. I have started looking for more of these 1988 M600s and their related nibs as I find them to be quite wonderful. The piston filling system holds a decent amount of ink and is very easy to clean and lubricate thanks to the user removable nib units. With the juicy nib though it doesn’t take long for the ink to run out. You can see that the blue ink window is full of ink and that the nib has blue ink on it’s tines (the fountain pen equivalent a baby’s face after a bowl of heavily sauced spaghetti). As I mentioned in the build quality section, the piston assembly is a weak point on these pens and as such it is wise to use the piston gently and make certain that it is properly lubricated. I paid $165 for this M600 and to me that price is certainly worth it for the fantastic nib. 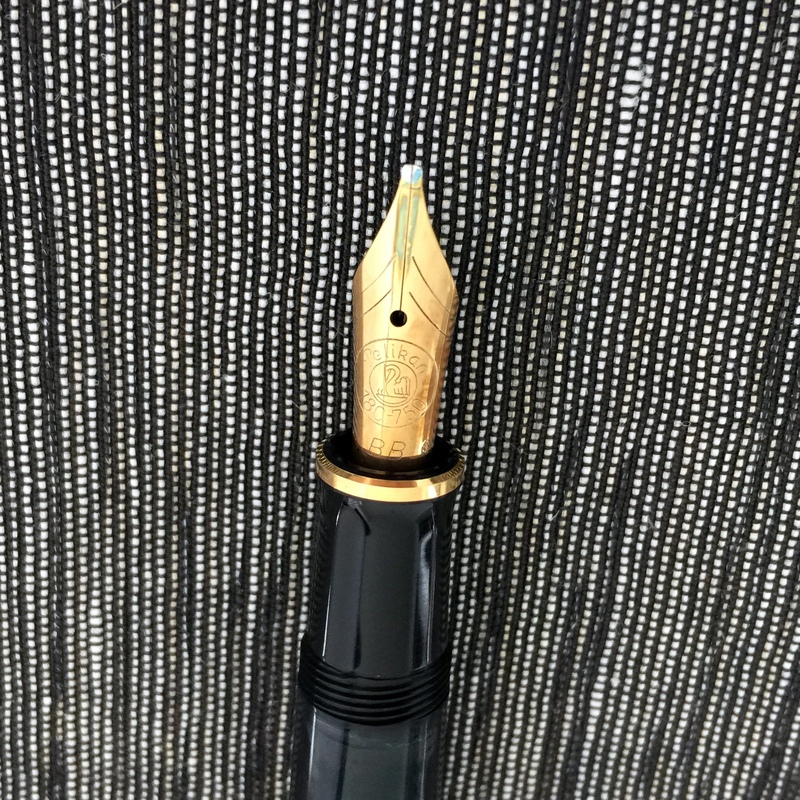 I think if you can get a 1988 model for $200 or less you will have a hard time finding anything that comes close with an ultra soft nib, piston filling mechanism, and threaded nib units. The great nib and design make this pen a winner despite mediocre build quality. Previous Post Aurora Optima Repaired and Back From Italy! Thanks for the review as I’m a fan of Pelikans but I’ve never tried a larger model. 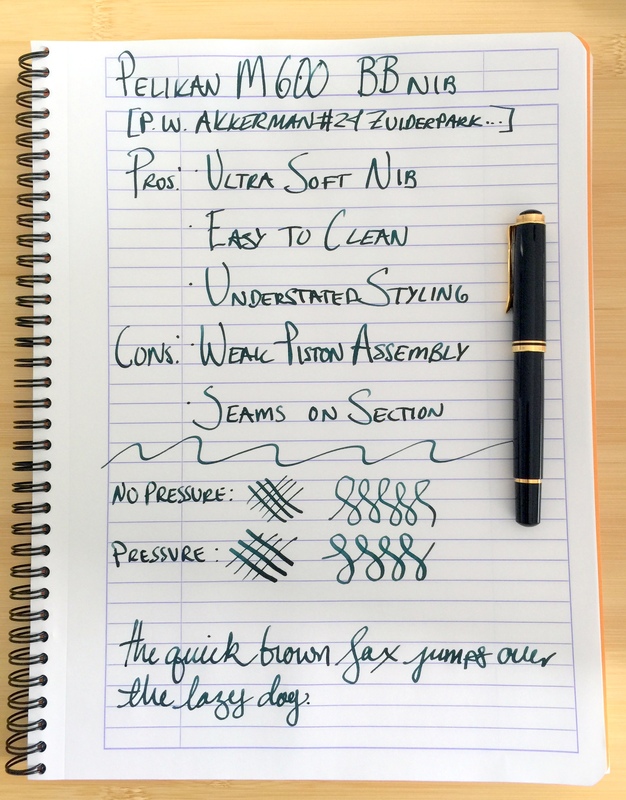 Do you use this FP for regular notes w/a B nib? I have small handwriting and I’d been curious if they’d still work for me. Thank you for the comment Rae! The old style M600 that I reviewed is the same standard size as a M200 and M400. I have big handwriting and if I am honest the BB nib is about as fat as I can handle so if you have small handwriting I would opt for a fine or or extra fine. It was truly all about the nib – great flex, smoothness and durability! Thank you for your kind comment Peter! 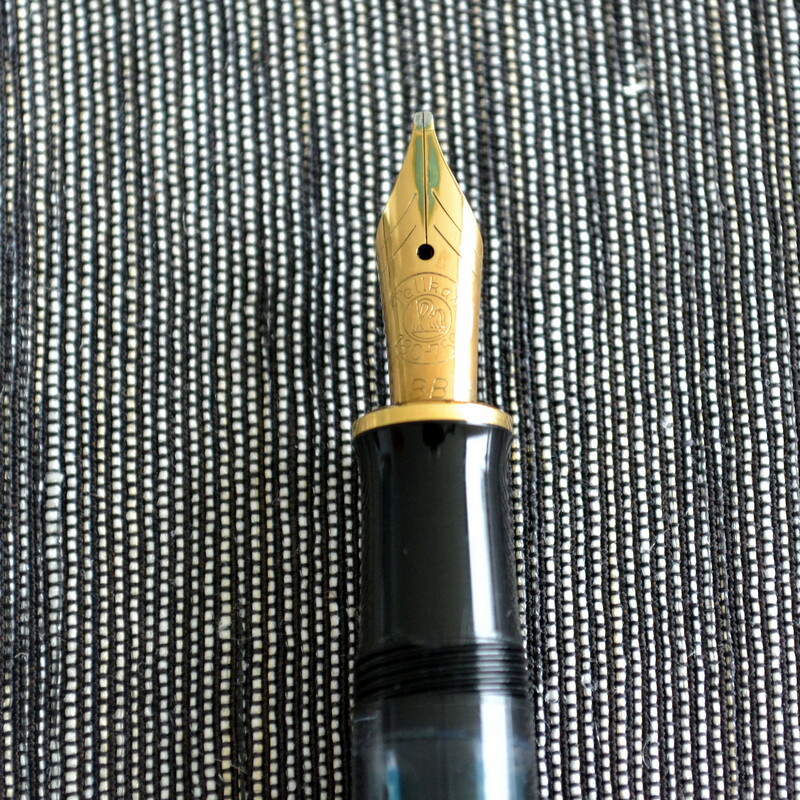 I wish Pelikan still made nibs as wonderful as the old ones…not to mention at those prices. Hi Pao, thank you for your comment. I briefly owned a M800 and it is a very nice pen indeed. I prefer the weight of the M400 and M600 pens as they do not have the heavy brass piston.